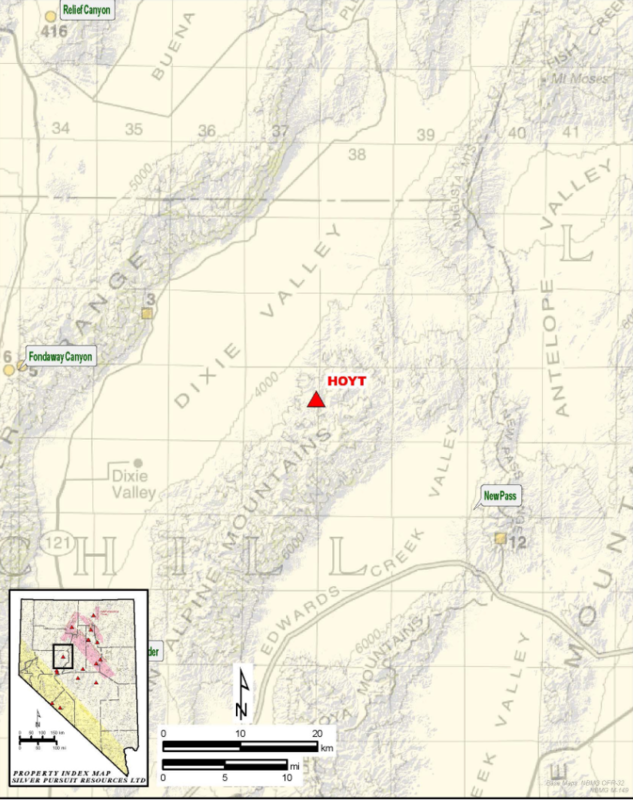 The Hoyt prospect is located on the west flank of the Clan Alpine Mountains, 60 miles east of Fallon, Nevada. 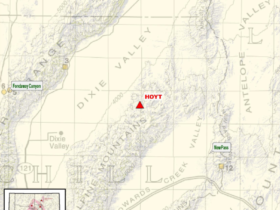 Dixie Valley lies to the west of the Hoyt Canyon project. Access to the project is by way of Dixie Valley, from the south or from the north, via dirt roads, over Shoshone Pass from Edwards Creek Valley and into Dixie Valley. Bernice Canyon is the drainage basin south of Hoyt. Elevations range from 4000 to 6523 feet (1220-1990 m) in the prospect area. Sheeted, vein zones with bulk-mineable potential and disseminated, “Carlin-type” mineralization hosted in the favorable Triassic-age rocks including the carbonate-cemented clastic rocks where adjacent to imbrications in the regionally important thrust faults. 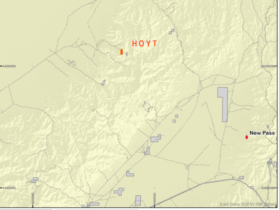 The Hoyt Mine is included in the Bernice mining district where production came from more than a dozen properties developed as early as the 1880’s. The primary commodities have been silver and antimony ores. Gold has been reported from several prospects in the district along with mercury, and other base metals. The county report includes production records that indicate some 100,000 ounces of silver were produced along with 43 tons of antimony (Lawrence, 1959). 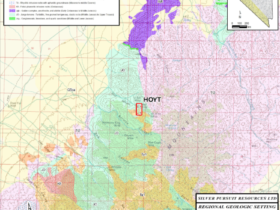 The Hoyt mine contributed “$60,000 in silver and 13 tons of antimony”, to the total district production. Numerous prospect pits and older dozer trenches are present along with several underground workings at the Hoyt project. 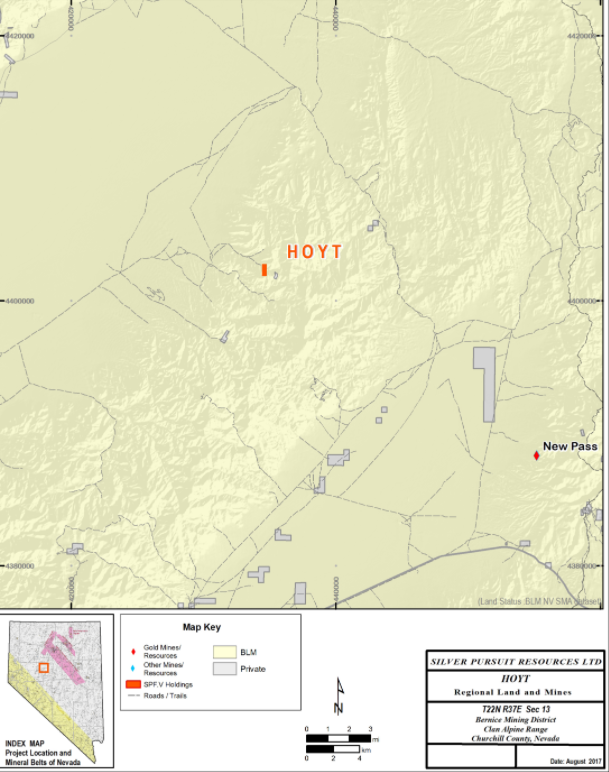 In 2009 and 2010, Columbus Silver held 38 lode claims in Hoyt Canyon. Geologic mapping and rock chip sampling helped identified two target zones as a focus for more detailed study. Most of the 74 rock chip samples collected by Columbus Silver were from the mine dumps and prospect pits. Twenty-two samples carry at least one ounce per ton silver. Highest-grade, dump samples carried 35.4 opt silver; the highest gold values in dump material is 3.18 g/t (0.093 opt Au with 16.5 opt Ag). Sedimentary, host rocks at Hoyt Canyon are Triassic-age units in the upper-plate of the Fencemaker Thrust, a low-angle, late-Jurassic fault (Speed, 1976). Imbricated structural sheets are present in the upper plate of the thrust fault and include the rocks at the Hoyt Canyon project. The area of interest is bounded on the east by a fault with Tertiary-age volcanic rocks in the hanging wall of a steep north-south fault. On the west margin of the area of interest, is a pediment with valley fill outboard (to the west) of the pediment. Triassic rocks exhibit multiple phases of ductile deformation at outcrop and map scale. Folding is thought to be important in development of structures that localize precious metals mineralization. Lithologies at the Hoyt Mine area are mostly fine-grained sedimentary rocks. Bedding structure and lithologic composition suggest the rocks were deposited in a shallow-marine environment proximal to a fluvial/deltaic depositional environment. Three lithologic sequences are mapped in the Triassic rocks and appear to occur in imbricated structural blocks. Speed assigned the older units to the “Bernice Canyon Formation” (TRbc) and the overlying rocks to the “Hoyt Canyon Formation” (TRhc). Multiple stages of ductile deformation are evident at outcrop and map scale. Minor folds observed at outcrop scale suggest the Hoyt Mine workings may be developed at the hinge zone of sharply folded, sandy dolomites. The oldest package of rocks mapped at the Hoyt project includes a thick sequence of recessive weathering, strongly folded, “pencil shale” and siltstones with a calcareous matrix (TRbcl- lower Bernice Canyon Formation). The “middle” sequence of the map units (TRbcu- upper Bernice Canyon Formation) is host to vein mineralization at the historic mines in the project area. These rocks are predominantly made up of very thin-bedded dolomitic siltstone, silty dolomites and local beds of coarser-grained (sandy) rocks with dolomitic matrix. The upper package of rocks (TRhc) referred to as the “Hoyt Canyon Formation” (Speed, 1976) is comprised of an alternating sequence of dolomitic to calcareous siltstones with gray micritic to pelloidal limestones. 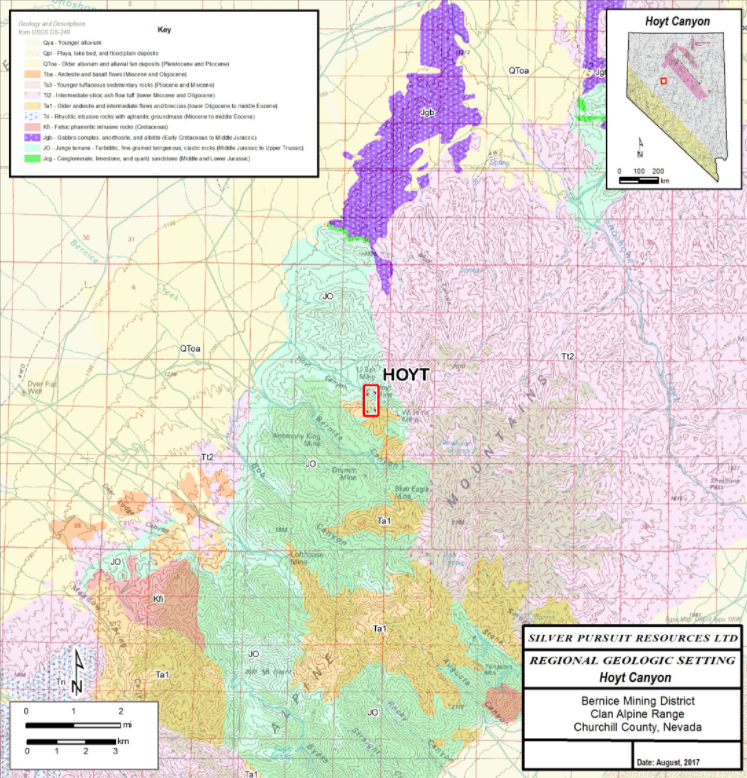 The rhythmic sequence of TRhc siltstones/limestones makes up colorful, stacked outcrops that form ridges on the north portion of the Hoyt project. The TRhc in the northern Clan Alpine Mountains is part of the “Fencemaker Allochthon”. Regional structure of the Stillwater Range, Dixie Valley and the Clan Alpine Mountains are defined by thrust faults developed during late Early to Middle Jurassic time (Speed, 1976). The Fencemaker thrust system has resulted in emplacement of fine-grained sedimentary rocks “Bernice Canyon Formation” (as described above) over lower plate rocks of carbonate shelf deposits of Triassic age. Lower plate rocks include the Star Peak Group of Middle and Upper Triassic age. The historical production is of high-grade silver but gold has been identified in the system as well. Ore was produced from a series of adits at the Hoyt mine, where shear zones in Triassic- age limestone, siltstone and sandstone have quartz veining that contained the highest-grade ore. Analysis of trace element distribution from the rock chips collected by Columbus Silver indicate the highest gold values (3.183 ppm) are associated with multi-ounce silver values (up to 35.4 opt). Arsenic and antimony are associated with precious metals mineralization. Anomalous gold (up to 528 ppb) occurs with As ~1000 ppm and has associated high Sb values in the trench area on the northern edge of the covered target area (Ag = 1.1 ppm for this sample). Of the 74 samples collected, 40 samples carry 1 ppm mercury or greater. One float chip sample is noted to have cinnabar filling a hairline fracture and reports with mercury value of 23 ppm. 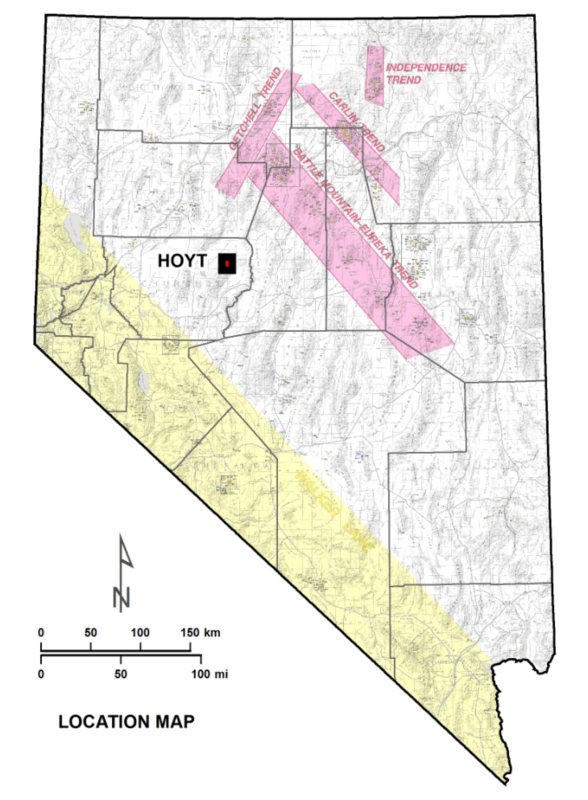 Three target zones are identified at the Hoyt project. 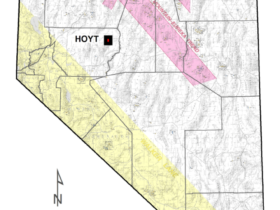 The “Hoyt” target zone is a covered area along the projected northwesterly strike of the historical mine development. Recessive-weathering units are exposed in one dozer trench in the covered area. Samples from the trench contain gold and silver values up to 0.53 g/t (0.015 opt) and 8.2 ppm, respectively. 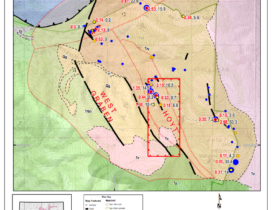 A second target zone, known as the “West Graben” is parallel to the Hoyt Zone and is a down-dropped block filled by older alluvial deposits with potential as a buried drill target. 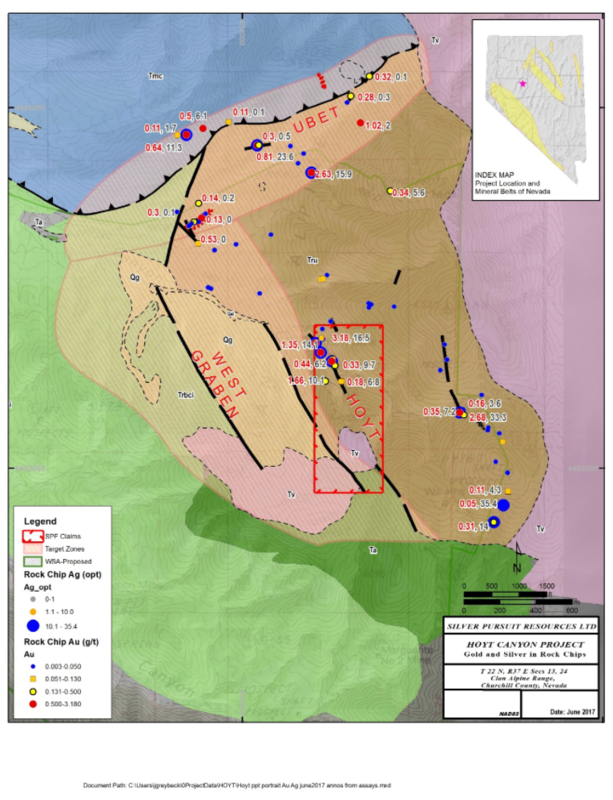 The “UBet” target zone is a late-Jurassic age, thrust fault where select rock chip sampling has been collected over a strike length of approximately 1000 m with several values over 0.5 g/t gold. 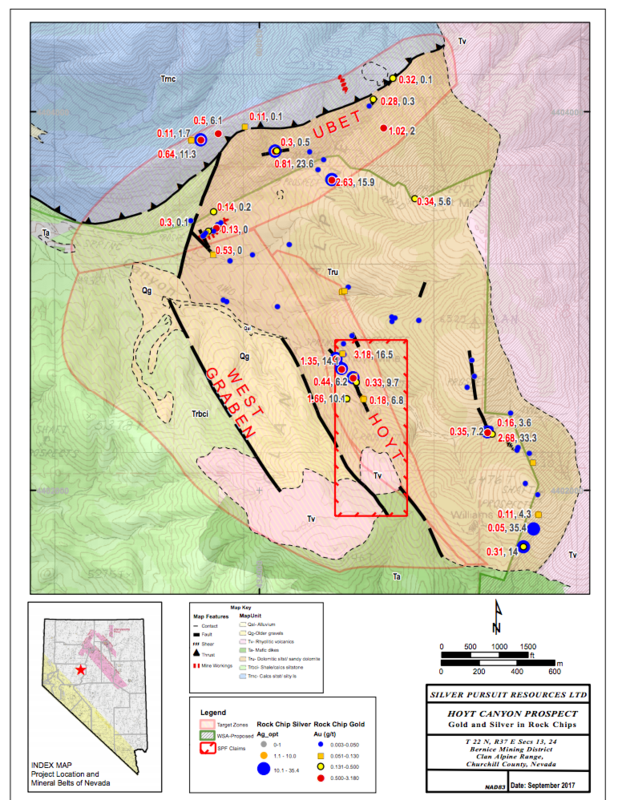 Systematic sampling and local detailed geologic mapping is planned to more clearly understand the distribution of the mineralization and develop drill targets at the Hoyt project. 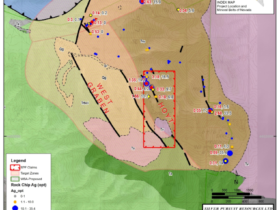 These data will be evaluated and ground-based geophysical surveys may follow to define drill targets beneath the covered area along the projected strike of mineralization from the well-mineralized underground workings.